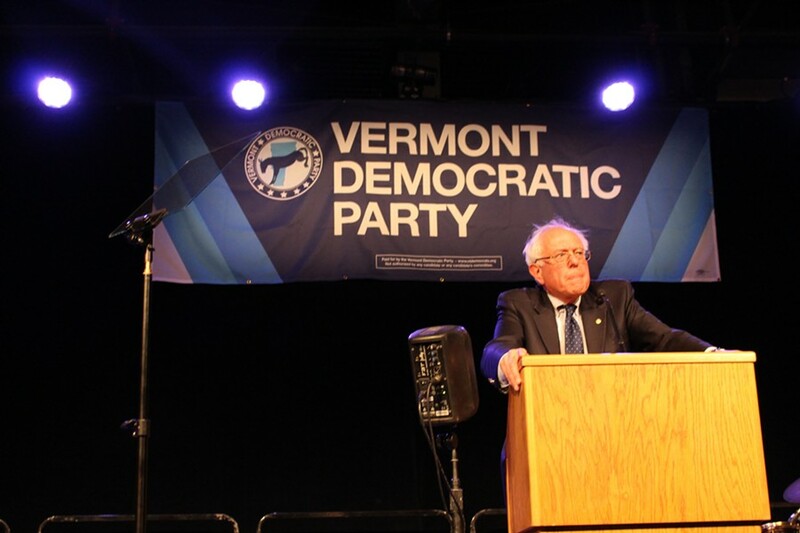 Sen. Bernie Sanders addresses the Vermont Democratic Party's Curtis Awards dinner in June 2014. Even as he launched a campaign for the Democratic presidential nomination Thursday, Sen. Bernie Sanders (I-Vt.) insisted he was not a Democrat. "No, I am an independent who is going to be working with the —" Sanders told Seven Days Thursday afternoon, cutting himself off mid-sentence. "I am what I am, and I will have to deal with the state-by-state regulations. But I am what I am." The first state whose regulations he will have to deal with is New Hampshire, home of the all-important, first-in-the-nation primary. The Granite State's election laws restrict the Democratic contest to Democrats. "If they're going to run in the primary, they have to be a registered member of the party," New Hampshire Secretary of State Bill Gardner told CNN. "Our declaration-of-candidacy form that they have to fill out says 'I am a registered member of the party.'" That would be difficult for Sanders, given that Vermont has no party registration system. Voters simply select a ballot of their choosing — Democratic, Republican, Progressive or Liberty-Union — at their polling place during primary elections. Gardner told WMUR-TV he won't rule on whether Sanders is qualified until his state's filing period opens in October, but that the law is clear. Tad Devine, a veteran political operative and consultant to Sanders' campaign, said Thursday he's unconcerned about the situation. "I don't think there is any real world impediment to Bernie Sanders getting on the ballot in New Hampshire," he said. Devine noted that plenty of candidates who have competed in the Granite State over the years come from states in which there is no party registration process, including Texas' George W. Bush, Tennessee's Al Gore and, more to the point, Vermont's own Howard Dean. Furthermore, Devine argued, Sanders has twice sought the Democratic nomination for Senate (in both cases, he declined the nomination upon winning), caucused with Senate Democrats and is featured on the Democratic National Committee's website. "Bernie's position in the process, I would suggest, is determined by a piece of paper that he signed and filed with the Federal Election Commission today," the consultant said. Sanders acknowledged his long and complicated history with the Democratic party Thursday: He first won office by defeating the Democratic mayor of Burlington and has faced Democratic, Republican and Liberty-Union opponents alike. "There's no secret that I think that the Democratic Party has not been vigorous enough in standing up for working families. I've said that repeatedly and I say it again," Sanders told Seven Days. "On the other hand, I will also tell you [there are] some great people in the Democratic Party that I work closely with. But right now, it seems to me the most effective and practical way to go forward is to participate in the Democratic primary process." Sanders acknowledged that he enters the race as an "underdog," but he said he's been "impressed" by recent polls in New Hampshire and Iowa showing him gaining ground. "My first problem is that in those states and throughout America, I think the majority of the American people do not know who Bernie Sanders is at all — never heard of me — and Hillary Clinton is known probably by 98 percent of the American people," he said. "So we're going to have to work hard, and I intend to do that — to get the word out." A major challenge, Sanders said, is that he expects to be "heavily outspent." "You know, they're talking about the Republicans and Secretary Clinton raising well over a billion dollars, and we're not going to get anywhere near that," he said. "But I will tell you that we can raise a substantial sum of money through small, individual contributions." Sanders said that, as of 3:30 p.m. Thursday, his campaign had already collected $500,000. The Vermonter bristled when asked why he announced his candidacy from the nation's capital — not his home state. "Why did I make my announcement—?" he said. "I made my announcement nationally today. OK? We sent out a message to several hundred thousand people." Asked how he would manage to effectively represent Vermont in the Senate while campaigning for president, Sanders said he would be working "very, very hard." "I am a hard worker and I will — we have a very strong staff, and I will devote a considerable amount of time to Vermont's issues as I run for president," he said.